Kyrgyzstan's new parliament has agreed on a three-party coalition government, creating the first parliamentary democracy in Central Asia. Three of the five parties that won seats in the October election will share power. It follows months of political turmoil after former President Kurmanbek Bakiyev was ousted in a mass uprising. Earlier, a blast occurred in the capital, Bishkek, close to a stadium where ex-officials are on trial. Mr Bakiyev and 27 officials of the deposed government are accused of involvement in the 7 April killings of 85 opposition supporters during a rally in the capital. It is alleged Mr Bakiyev ordered troops to open fire on protesters. He has since fled into exile in Belarus and is being tried in his absence. The trial has been postponed. The new coalition is in stark contrast to other Central Asian nations, dominated by post-Soviet era strongmen. Opposition hardline nationalist party Ata Zhurt - whose leader was a minister under the former president - narrowly won the election but failed to achieve an outright majority. Despite fierce wrangling it failed to bring other parties on board. The new coalition has been formed between the Social Democratic Party of Kyrgyzstan, which came second, and Respublika and Ata-Meken, which finished fourth and fifth respectively. Almazbek Atambayev, leader of the Social Democrats - who also served as deputy to President Roza Otunbayeva in the interim government - has been put forward as prime minister. Respublika leader Omurbek Babanov has been nominated as his deputy. Ata-Meken leader Omurbek Tekebayev will become the speaker of parliament. The third-placed pro-Russian party, Ar-Namys, declined to join the coalition. The political breakthrough comes less that six months after inter-ethnic violence in southern Kyrgyzstan in which nearly 400 people, mostly minority Uzbeks, were killed. 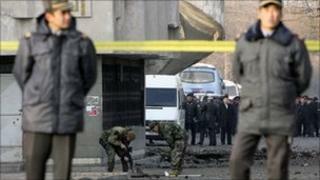 On Monday, four suspected Islamist militants were killed in the southern city of Osh by security forces. The latest unrest underlines tensions in Kyrgyzstan, a former Soviet republic that hosts US and Russian military air bases. US Secretary of State Hillary Clinton is to visit Kyrgyzstan on Thursday.